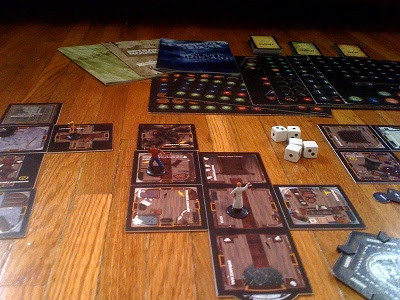 For the first review from the horror genre, its time for Betrayal at House on the Hill . In Betrayal, each of the players takes on the role of an explorer that is wandering around an old, creaky, haunted house. While they are wandering around, "scary" and "ominous" things begin occurring. They may run into a room where blood is pouring down the walls, they may encounter a family of skeletons, they may enter a mystic elevator, fall through the floor, find a secret stairway, or many other things. During this time, all of the explorers are on the same side, but because they don't trust each other much, they are trying to improve their character with items and stat bonuses because, eventually, an ominous event will occur drastically altering the rest of the game. (What actually occurs here is that certain rooms have an Omen icon, in which the player will draw an Omen card, and then roll several dice. If the total on the dice is lower than the number of Omen cards in play, then the "Haunt" begins). When the Haunt begins, one of the players will suddenly betray all of the other explorers (or die and take on the roll of the monsters - the determination of who is the traitor depends on which Omen started the Haunt and which room it was found in). The traitor will take the "traitor's tome" instruction manual, and the explorers will take the "survivor's guide" instruction manual, go to different places, and read the scenario from their character's perspective. This leads directly into the first pro of Betrayal: replayability. There are about 50 different scenarios in the game. In some scenarios the house may be alive, Dracula or Frankenstein's monster may come out, you may be playing chess with Death, ghosts, mummies, vampires, etc. may be involved. For each of these scenarios the explorers and the traitor have their own rules about what they are trying to do in order to defeat the other side, and each has its own win condition. Thus the second pro of Betrayal: the scenarios are well done. Each one plays very differently, and the concept that one side does not know what the other side is trying to do is an innovation that I had not seen in games other than Betrayal. Now for the cons: First, since there are so many scenarios, each with different counters (for a total of approximately 8,000,000 counters give or take 7.5+ million), the amount of time spent looking for the correct counters can be somewhat frustrating. Secondly, since each side only knows their own rules, there can be situations in which the players don't necessarily know if certain things are legal - and so it is useful to have someone that is familiar with the game present to mediate these disputes. Overall, Betrayal at the House on the Hill gets a 9.5/10. It is by far the best game of the horror genre that I have ever played. (Full disclosure - I don't play horror games especially often, and I only tried this one because I found a new copy of it for $3.) I highly recommend this game to anyone who is comfortable playing a game of the horror genre, but if you don't want to read cards that are about blood on walls, skeletons, zombies, etc, please don't bother with the game, because I know that the subject matter of the game can make people uncomfortable. If Betrayal at House on the Hill sounds interesting, you might also check out Cargo Noir, Glory to Rome, and Battlestar Galactica. First, since there are so many scenarios, each with different counters (for a total of approximately 8,000,000 counters give or take 7.5+ million), the amount of time spent looking for the correct counters can be somewhat frustrating. This is something the second edition of the game rectified. Cherished tokens like Rocketship and Dog were replaced by a much smaller pool of generic tokens: one set for items, several different sorts of general purpose monsters and the "master monsters" too, like Crimson Jack and Frankenstein's Monster. Awesome to know, thanks Tyler! Something that made my set have even more tokens is that my copy came with only half the tokens, but two copies of them (instead of having all of them). When I emailed Avalon Hill they gave me another full set, so I wound up with 3 copies of several of them. There are, indeed, a lot of little tokens in this game. Still, it's a lot of fun, with a ton of replayability. My wife and I get together semi-regularly with some other married couples to play games, and we often end up playing Betrayal because it's so much fun. We have yet to get the same scenario twice. I'll admit, though, that some of the scenarios are really unbalanced. The last time we played, the traitor had shrunk everyone to the size of a mouse, and had sent a pair of cats to capture and then eat us. The cats were both ridiculously powerful--we couldn't physically damage them, and their mental stats were as good as or better than everyone else's. (Which doesn't make a lot of sense to me--why would a cat be smarter than, say, a twelve-year old girl?) We had to find a toy airplane, pick up at least half the surviving heroes, and escape out the window. The cats could move very quickly, though, and the toy airplane could be knocked out of the air. Once it was on the ground, was hard to get it back in the air, because the cats could drag anyone who got the engine started out of the plane. We eventually all got munched. Those cats were just ridiculously over-powered. Love this game! How on earth did you find it for $3 Josh? I got lucky - my local Hastings had it on super clearance. But, honestly, I've also found it two more times for about $10 at another clearance deal (and gave one to a friend)... just had great luck with this one!